This is a recipe for making at home crispy and delicious Restaurant or Dhaba Style Rolled Chicken/Mutton Keema Balls. 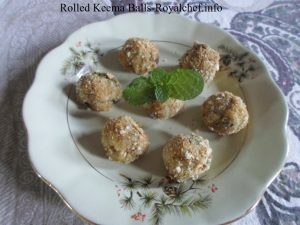 The Rolled Keema Balls makes a great starters snack for any kind of party, including kitty and cocktail parties. 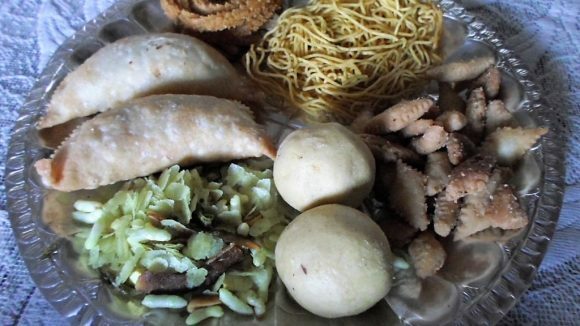 They can also be served as an add-on to the main course meals. Boil the Keema in a little bit of water and keep aside. Then, boil, peel and nicely mash the Potatoes. Chop the Green Pepper and Coriander leaves. Put the Keema and all the above ingredients in a mixing bowl and mix nicely. Roll the Kheema Balls into small sizes as per you wish. Then, coat the rolled Keema Balls with the Rice Flour and deep-fry them over a low flame.